Denali (formerly called Mt. 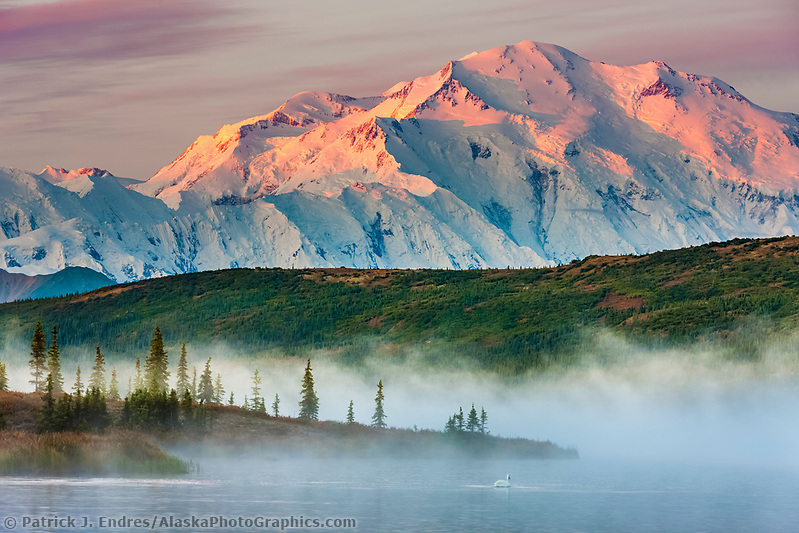 McKinley) is North America’s tallest mountain. Recent measurements put the summit at slightly higher than its previously recorded height of 20, 320 feet! It is the dominant feature of the Alaska Range horizon and its north and south summits can be seen from hundreds of miles away. 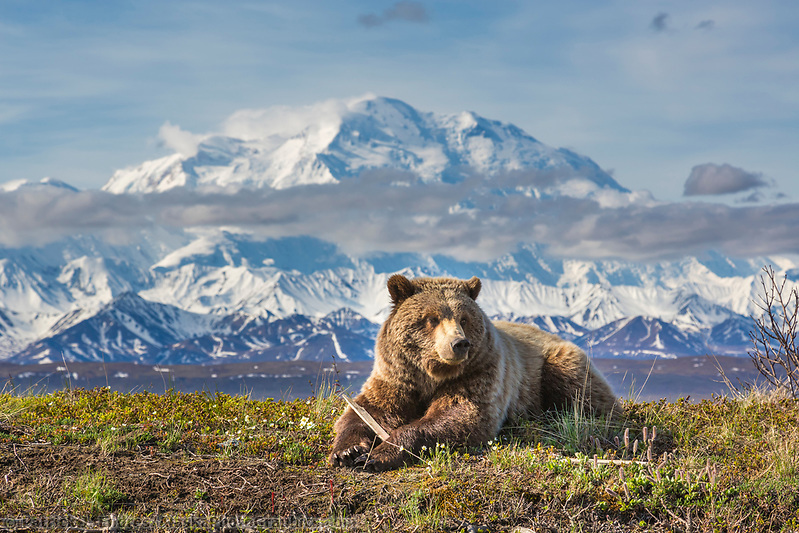 As one of Alaska’s greatest icons, it lures thousands of tourists to Alaska with hopes of getting a glimpse of the often cloud obstructed massif. All of the Mt. Denali photos here are available to license as stock photography for commercial use or for purchase as fine art prints to decorate your home or office. 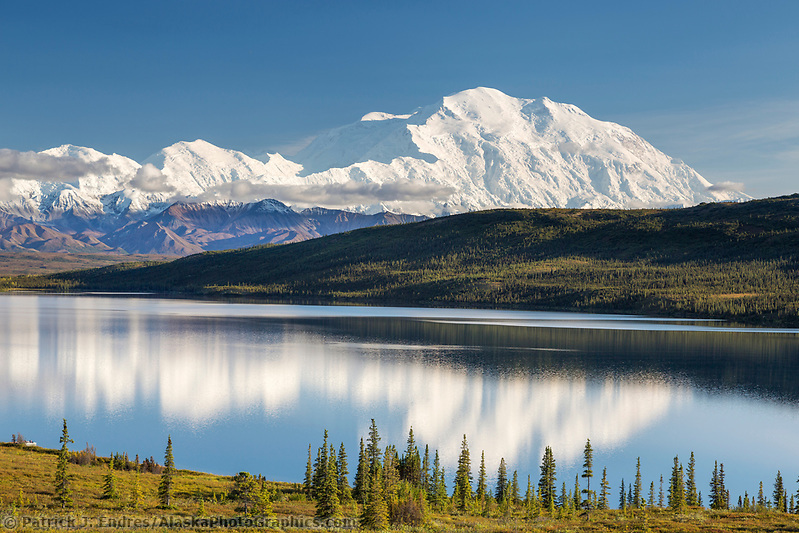 The Alaska native Koyukon people have referred to the mountain as “Denali” for centuries. It was only in recent times (1896) that a gold prospector named it “Mount McKinley” after the presidential candidate William McKinley. In August 2015, following the state of Alaska’s congressional leaders, the U.S. Department of the Interior under the Obama administration officially changed the name back to its First Nations heritage name of Denali. During his 2016 presidential election campaign, Donald Trump threatened—idiosyncratically—to revert the name back to McKinley, ostensibly for political reasons. Following his election, it currently retains its Denali name. Even during its temporary name status of Mt. 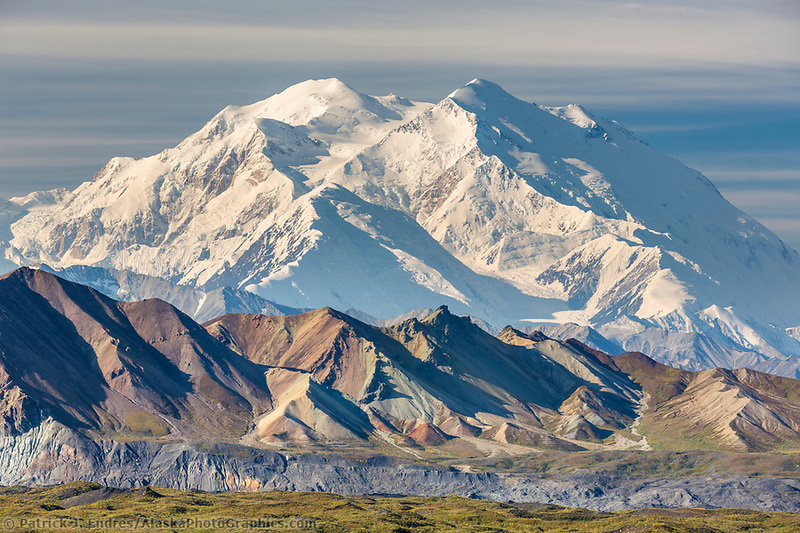 McKinley, most Alaskans referred to the mountain as Denali anyway. This is likely to be the case in spite of what politicians choose to call it in the future. 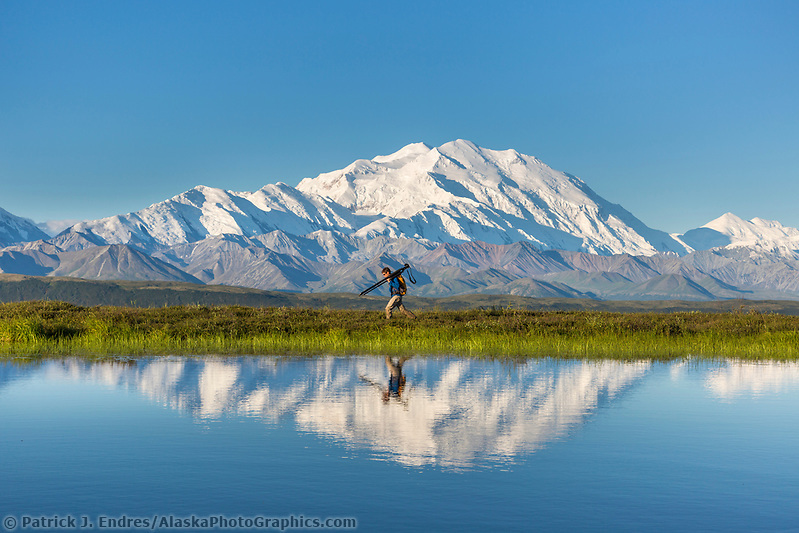 Denali is among the tallest three mountains in the world when measured vertically from base to peak. Using this measurement, it is significantly taller than mount Mount Everest. Mt. Denali has two prominent peaks that span across its very broad summit. 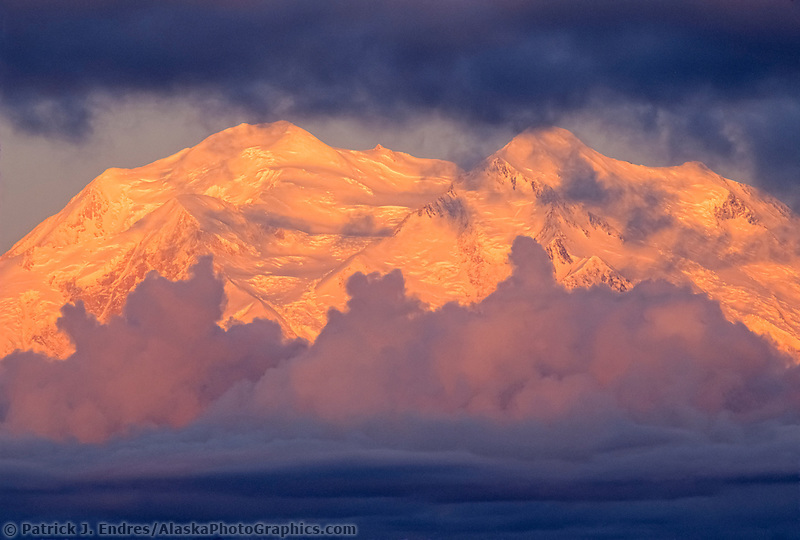 The South Summit is the highest at 20,320 feet, and Denali’s North Summit is 19,470 feet. Mountain climbers come from all over the world for an attempt to summit this great mountain. 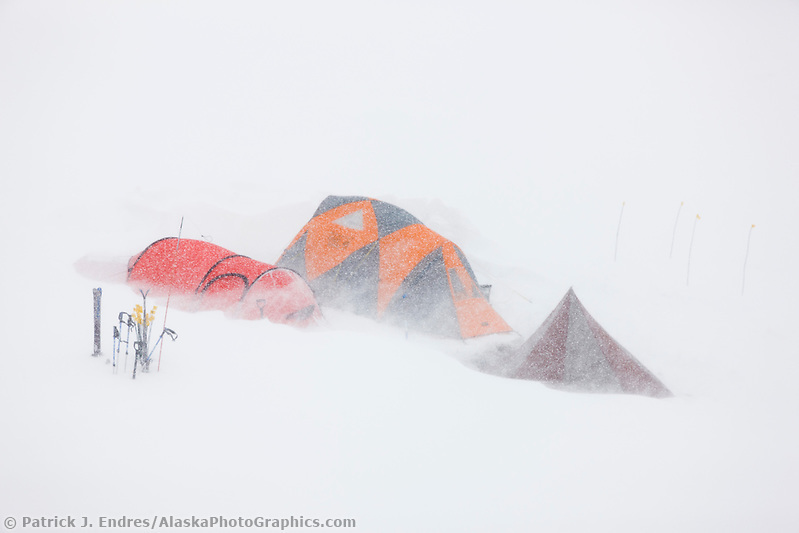 Expeditions can last three weeks and the mountain holds a notorious reputation for severe and quickly changing weather. Most climbers base out of the small town of Talkeetna to the south. 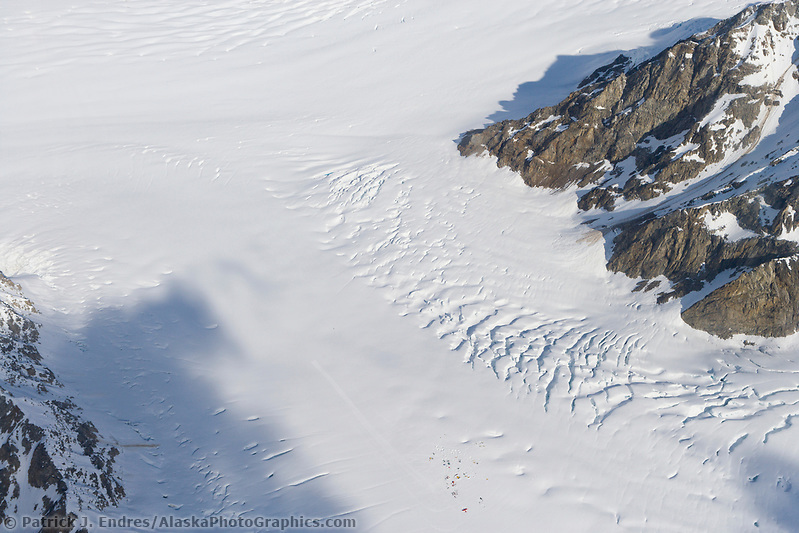 From here they board a small plane outfitted with skis that can land at the base camp on the Ruth Glacier, at approximately 10,000 feet altitude. From this rather large and sophisticated base camp, they begin their ascent of the mountain setting up a series of smaller, individual base camps along the way. The choice to make a summit attempt is a strategic decision based on many factors and usually happens in a 24 hour period. Denali is such a monstrous geological landmark that it creates its own weather. Extreme wind speeds mixed with frigid cold weather make for a dangerous and harsh environment. Temperatures of -75.5 degrees Fahrenheit have been recorded, with wind chills well below -100 degrees Farenheight. The tales of mountaineers surviving extreme weather on its high altitude slopes fill many books. Other climbers who came under the spell of this great mountain fell victim to its slopes and never returned. They remain on the rock and snowy slopes, or fissured crevasses of surrounding glaciers. Nearly every year, lives are lost on the mountain. To take a flightseeing trip that circumnavigates Denali is a visual and spellbinding experience. If you think it appears large from the ground, an aerial view is truly mind-blowing. It is a great expanse of snow, ice, glaciers, and peak after peak that seem to go on forever. 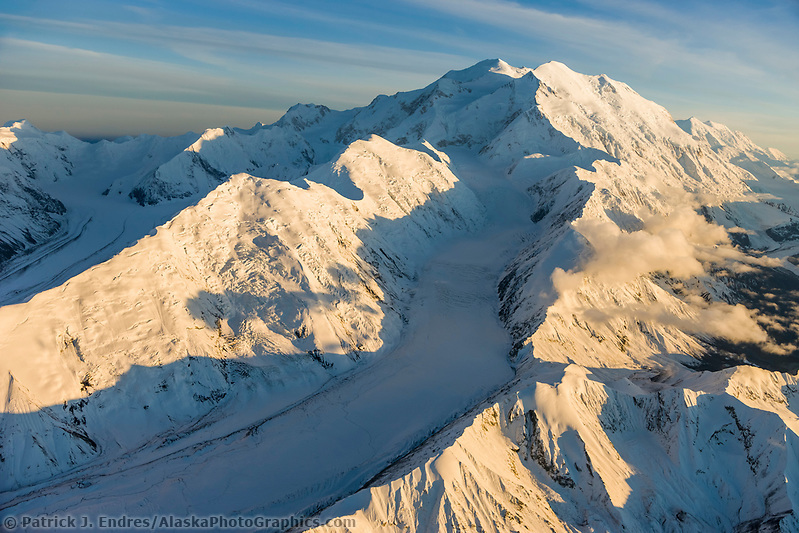 Five major glaciers flow from the slopes of Mt Denali. 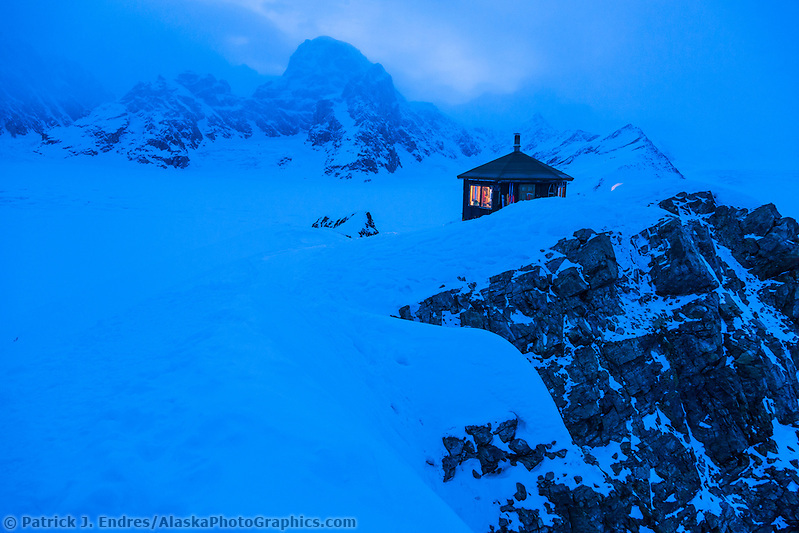 The Ruth Glacier flows to the southeast into the Ruth Amphitheater, where adventurers can stay in the remote Don Sheldon mountain house. The Amphitheater is also home to the large and established base camp where mountaineers begin their ascent of the mountain. Mt. 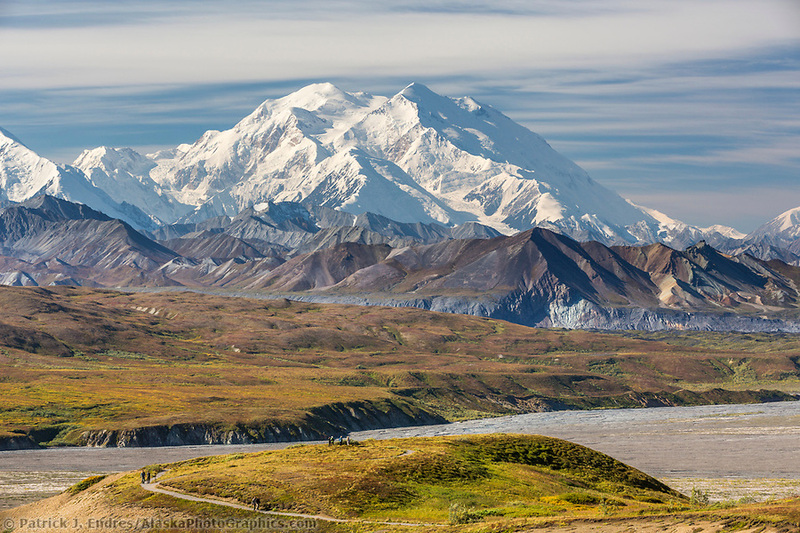 Denali is the crowning jewel of Denali National Park, a 6 million acre wilderness situated in Alaska’s Interior. Species of flora and fauna have adapted unique ways to survive the cold and wind. Wildlife thrives in this harsh, sub-Arctic climate and hundreds of species of wildflowers and tundra plants adorn the summer green hillsides. Caribou, moose, Dall sheep, wolves and grizzly bears inhabit the rolling tundra and mountain topography. The park has the greatest density of grizzly bears in the world, and visitors come with high hopes of seeing this great animal in the wild. Visitors access the park via a narrow 90-mile gravel road, that traverses mountain passes and glacial rivers, revealing an astonishingly beautiful landscape. Backpackers and hikers can explore the wilderness surroundings by securing a permit to camp overnight in a designated section of the park. The number of overnight campers is managed tightly to ensure an uncrowded wilderness experience by all users. Mt. Denali towers over Alaska’s interior landscape, making it visible from vantage points on all sides, spanning hundreds of miles. 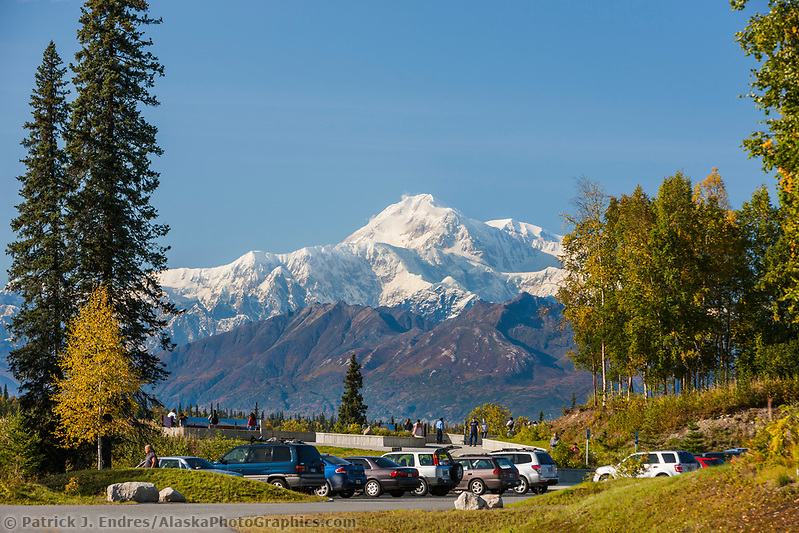 While some of the most famous and spectacular views of the mountain are along the Denali Park Road, there are many locations outside the park to see the mountain on a clear day (emphasis on a clear day). One such place is along the George Parks Highway connects Alaska’s two biggest cities, Fairbanks and Anchorage. Along this 360 mile roadway, Mt. 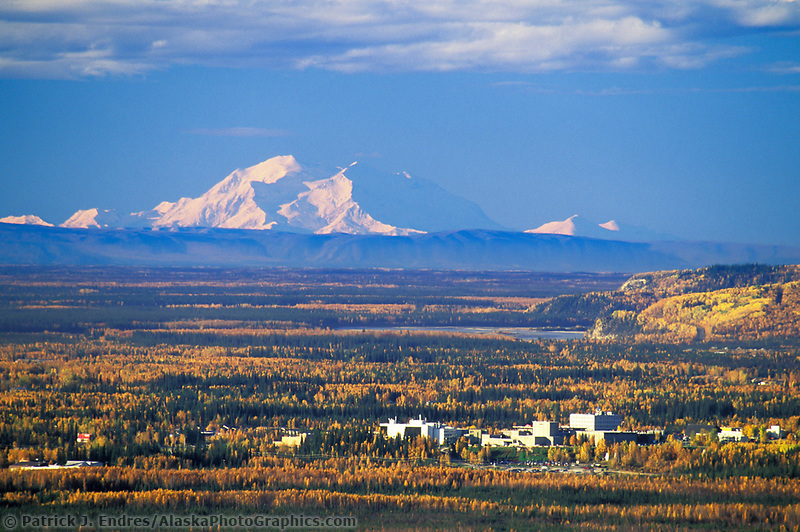 Denali is visible from numerous vantage points. 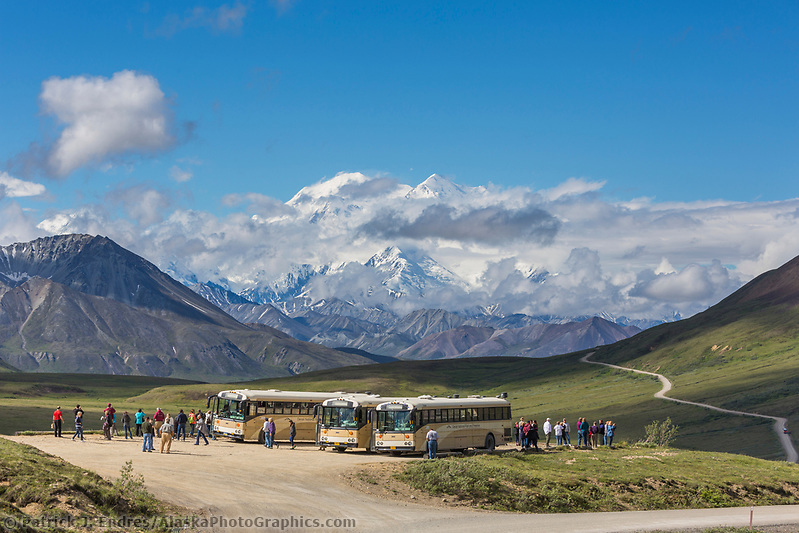 Tourists and residents alike are often treated to a view of Denali on their drive North as they come through Willow, Alaska. The mountain is often partly obscured by clouds, and sometimes, weeks can go by without a glimpse of the summit. Early morning and late evening tend to b the best time to catch a view of the mountain. I literally have thousands of Denali photos. While it is true that the mountain can be very shy and elusively hide its beautiful summit under tumultuous and roiling clouds, it clears frequently offering stunning views. It might not be clear for long, but patient waiting and good timing delivers a visual treat that is likely to remain in your memory for a very long time. I’ve trekked the tundra of Denali for more than three decades and one thing remains clear—no matter how many times I’ve seen the mountain, no two views are the same. The light is constantly changing along with the seasons, painting the sky around the mountain, and its snowy slopes in a continually changing cascade of colors. Standing at the shore of Wonder Lake in Denali National Park as the mist rises from the lake, and the great mountain reflects in the calm waters is one of nature’s most splendid and emotive views.